What is Prostate Artery Embolisation? 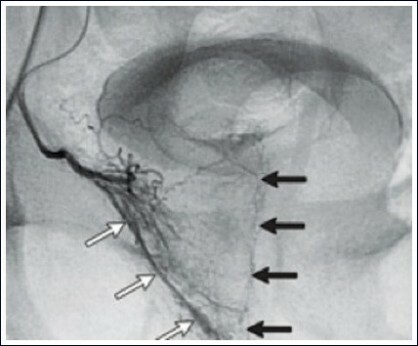 Prostate artery embolisation (PAE) is a minimally-invasive technique to treat lower urinary tract symptoms in men (frequency, hesitancy, dribbling, poor stream and nocturia). It is a non-surgical alternative to Trans Urethral Resection of the Prostate (TURP). If you have been suffering from lower urinary tract symptoms (frequency, hesitancy, dribbling, poor stream and nocturia), you may have an enlarged prostate. This is diagnosed by your GP or Urologist. The usual first-line treatment for an enlarged prostate would be medication. In some cases, however, this may not be beneficial and your symptoms may continue. An alternative treatment for an enlarged prostate is a surgical procedure called Trans Urethral Resection of the Prostate (TURP). This involves a general anaesthetic and surgical removal of part of the prostate gland. An alternative procedure is now available called Prostate Artery Embolisation (PAE). PAE is a relatively new procedure that aims to provide you the same symptomatic relief as TURP but without a general anaesthetic, surgery or the side effects of an operation. What happens if you choose to have PAE? If you choose to have PAE then you will be seen by an Interventional Radiologist (a doctor who specialises in minimally-invasive procedures under x-ray guidance). The doctor will discuss the procedure in more detail. You will have a preliminary planning scan to look at the prostate and the arteries in the pelvis. On the day of admission, monitoring equipment will be attached to your finger and chest. We routinely give all patients antibiotics before the procedure. A general anaesthetic is not required; some gentlemen find light sedation helps them to relax. The procedure takes up to 2 hours. The Interventional Radiologist will wear a sterile gown and his/her assistant will keep all equipment sterile. The skin over the groin will be cleaned with a sterilising solution and anaesthetised with local anaesthetic. The procedure takes place through a small needle-hole in the femoral artery in the groin, through which special tubes and guidewires can be inserted and manipulated into the prostate arteries, using x-ray guidance. Once the Interventional Radiologist is sure that the tubes are correctly placed in the prostate arteries, the arteries are blocked (embolised) with fine particles. The prostate is gradually starved of blood and shrinks. Both the left and right prostate arteries need to be embolised for this procedure to be successful. A special type of x-ray dye is used during the procedure and this can produce a warming sensation. Once the embolisation is complete all tubes and catheters are removed and the Interventional Radiologist presses firmly on the groin to prevent any bleeding. You will be taken in to the recovery area. The nursing staff will monitor your pulse and blood pressure and will check the skin in the groin for bleeding. If you have any discomfort at this point, the nursing staff can also give you pain relief. Most patients stay overnight and are discharged the following morning. The technique is relatively new but from the limited published data it appears safe and effective. There is a small chance of a bruise (haematoma) in the groin and some mild pelvic discomfort immediately after the procedure but this is normally managed with paracetamol and ibuprofen. It is advised that after you return home, you rest for three to four days. Occasionally some patients feel very tired after the procedure but this usually resolves within a week. The limited published studies on PAE suggest that over 70% of men will get symptomatic relief following PAE due to a reduction in prostate gland volume. There is a failure rate of of 5-10% owing to difficulties in identifying the prostate arteries in some cases. Please come and discuss your suitability for PAE with us. Some of your questions should have been answered by this page, but remember that this is only a starting point for discussion about your treatment with the doctors looking after you. © The Royal College of Radiologists, May 2008.